Dansport. Flesh Satin Only. Regular Width Only. 2 1/2" Heel Only. Order 2 sizes smaller than your American size. 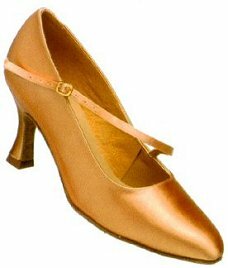 A standard T-bar shoe with a closed toe. 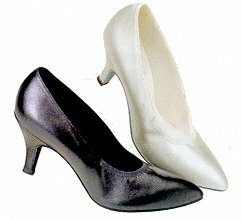 The heel is 2 inch slim. Made by International of England. Available in Black Leather only. Order 2 sizes smaller than your American size. 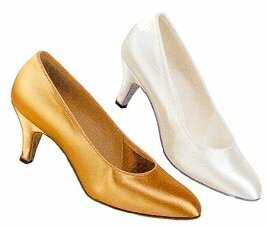 Beautiful clean-line court shoe with elastic around the foot opening. Made by Supadance in England. Order 2 1/2 sizes smaller than your American size. 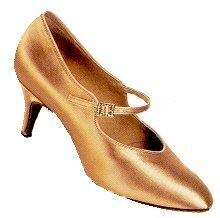 Special Note: Some combinations of width/heel/color not available -- call for details. Order 2 sizes smaller than your American size. 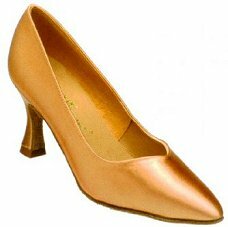 Available in Flesh Satin only. 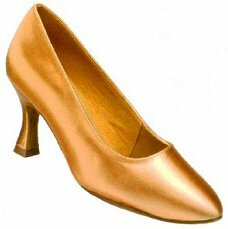 Heel comes in 2 1/2 inch only. 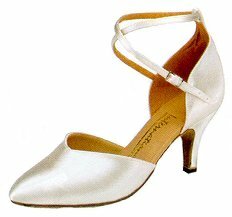 A rounded-toe court shoe with shorter toe box. Made by Supadance in England. Order 2 sizes smaller than your American size. 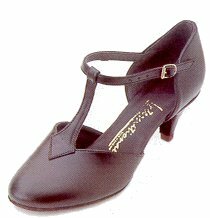 This slightly pointed toe ankle strap is the eye-catching original - beautifully presented by International Dance Shoes. Order 2 sizes smaller than your American size. Comes in White Satin only. Medium B only.